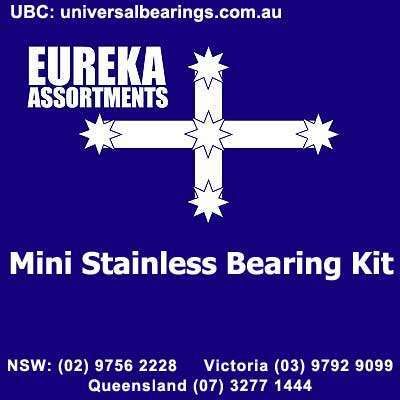 Miniature stainless bearing kit 120 piece. 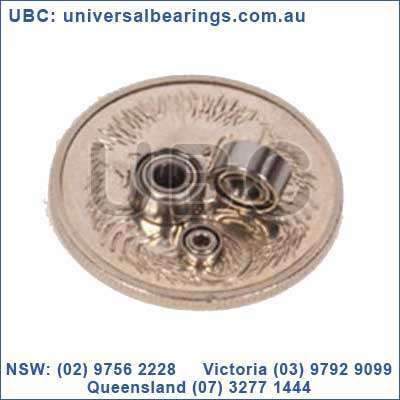 UBC Miniature ball bearings are composed in a variety of parts, including an outer and inner ring, balls, retainers and snap rings. 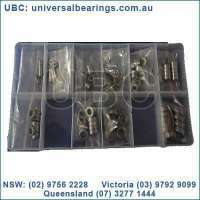 They may also have shields or seals, flanges and steel ball cages. 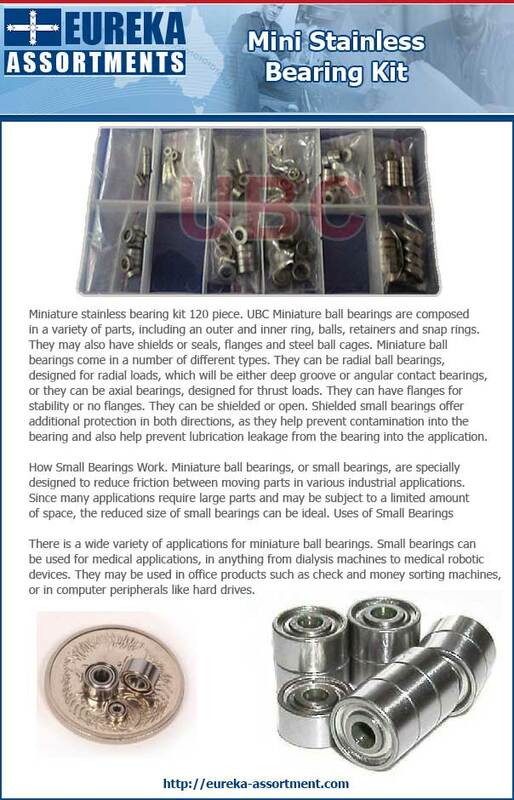 Miniature ball bearings come in a number of different types. They can be radial ball bearings, designed for radial loads, which will be either deep groove or angular contact bearings, or they can be axial bearings, designed for thrust loads. They can have flanges for stability or no flanges. They can be shielded or open. Shielded small bearings offer additional protection in both directions, as they help prevent contamination into the bearing and also help prevent lubrication leakage from the bearing into the application. 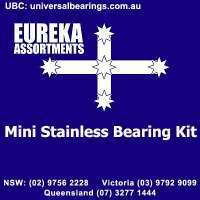 There is a wide variety of applications for miniature ball bearings. Small bearings can be used for medical applications, in anything from dialysis machines to medical robotic devices. They may be used in office products such as check and money sorting machines, or in computer peripherals like hard drives. It’s not enough to know that you need small bearings for your applications. 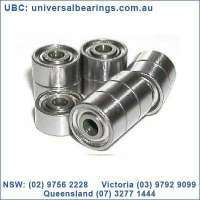 Ball bearings come in a wide variety of combinations, types and styles, and you will want the bearings that will provide the greatest efficiency for your applications. There are different materials, such as chrome and stainless steel, available. NMB small bearings are generally manufactured with DD400 stainless steel material. This reduces noise for applications that are noise sensitive and provides superior corrosion resistance and hardness. 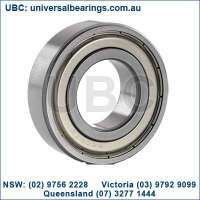 However, chrome material ball bearings are also available. There are the different types discussed above, open vs. shielded, flanged vs. not flanged, radial vs. axial load ball bearings. There are also different types of shields and seals to consider. Finally, there is the actual size of the bearing. NMB miniature ball bearings are of the highest quality and are designed to last and keep your applications running for a long time. 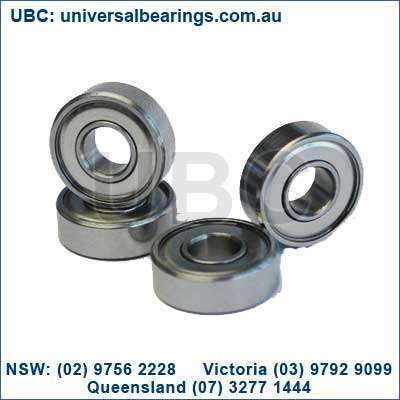 However, as with any machine parts, proper care and handling is a critical factor in making your bearings last. The best way to protect your small bearings is probably the use of seals and shields for your ball bearings. These features are specifically designed to prevent contamination. 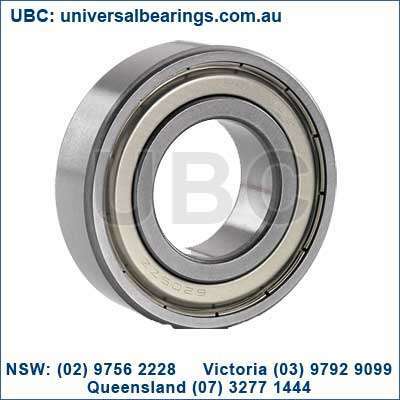 That being said, some dirt or other particles may still find their way into the bearing, which is why it is important to take other steps to protect your bearings. This means that when you are putting your bearings into your application, you should take extra effort to avoid any kind of contamination. 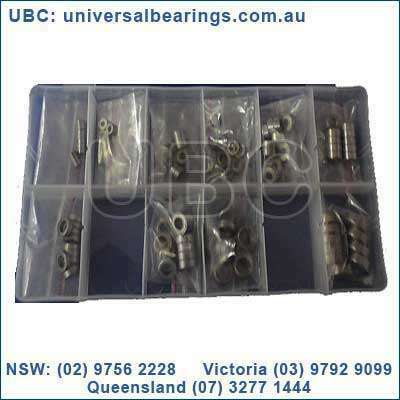 Keep the room where you will be handling the bearings dry and clean, and do not take the bearings out of their packaging until you are ready to use them. If you drop a bearing, discard it. 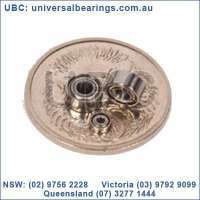 In addition to the fact that it may immediately accumulate damaging particles, there may be damage to the bearing which is not apparent to the naked eye. This damage may interfere with your application’s efficiency or, at the very least, cause the application to generate a great deal more noise than desired. Also, when applying lubricant to your small bearings, make sure that the lubricant is free from contaminants and refrain from using applicators like cotton swabs that could themselves contaminate the bearings.